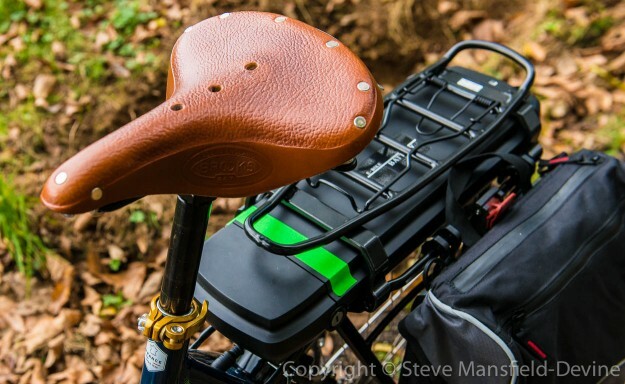 Getting the saddle on a bicycle at the perfect height is absolutely critical. This is something I learned decades ago. But I’d forgotten just how much trial and error is involved. Everything starts with getting the correct frame size. I used various online calculators, all of which suggested a frame size of around 58cm. As the largest size available on the Gitane Organ is 55cm, I went for that. The day the bike arrived I spent a happy hour or so configuring and tweaking it – pimping it up, in other words. New saddle (Brooks), lock (Axa) and grips (Ergon), an iPhone mount and light mount. I extended the handlebars to the maximum height for the most upright seating position (more on this in a separate post soon) and, of course, I adjusted the saddle height. I was tightening the hex bolt for the seatpost clamp when the head stripped out. The torque wrench I was using was set to 12ft-lbs, actually marginally below the recommended 12.8. Alas the seat was now fixed somewhat too low. Actually, that wasn’t the only hex bolt I stripped. I managed to do the same on one of the Ergon grips. Now, maybe I’m a bit cack-handed, which is possible. And maybe the hex bit I was using wasn’t in its first flush of youth. But the fact is that both bolts were, in my opinion, unnecessarily aluminium. I blame racing. Or cycle sports in general. They have infected the cycling world with the notion that everything has to be the lightest possible weight. You see this everywhere, even in places where it’s not going to make the slightest possible difference. 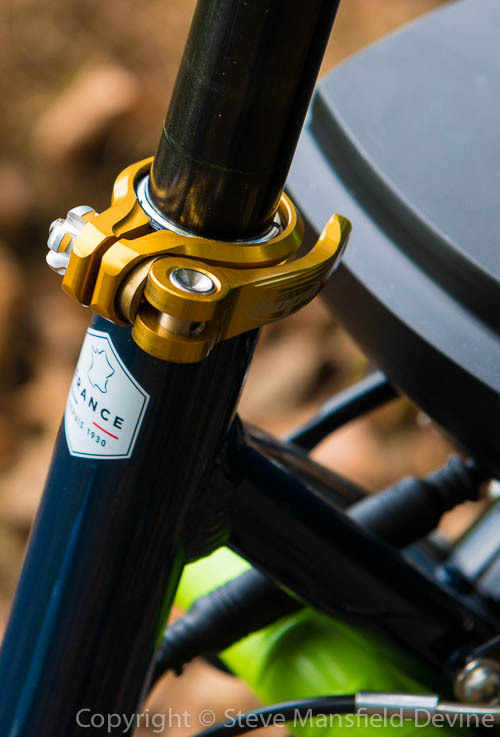 The bolt in the seatpost clamp is on a Dutch-style e-bike – hardly the sort of mount where micrograms of weight saved are going to make a difference. For that matter, the Ergon GC1 Biokork grips are made specifically for swept-back handlebars, which you’re only going to find on bikes designed for pootling, not racing. What I choose to put in my panniers; what clothes I’m wearing; what’s in my pockets; what I had for breakfast; whether I had a piss before setting off – these are all things that are going to affect the performance of the bike far more than whether the seatpost clamp or grip manufacturer has used small bolts made of aluminium or, gee, I don’t know, let’s say steel. I went online to order a new seatpost clamp. That wasn’t quite as simple as it might have been. I Googled a bit and found out about the various standard sizes. With my trusty callipers, I found that the seatpost itself is 27.2mm diameter – pretty normal. That might suggest a clamp size of 28.6mm. But I also read that 31.8mm isn’t unusual. When measuring the seatpost diameter, I’d also noticed what seemed to be a shim inside the seat tube. And being Dutch-style, the Gitane Organ has beefy tubing. Ultimately, the clamp needs to match the tubing rather than the seatpost. I went out to the garage again to take a closer look and found that the original clamp was stamped ’35’. That means 34.9mm in real money, so that’s what I ordered. In the meantime, though, I obviously wanted to ride the bike. The seat wasn’t too far below where it needed to be, but boy did I feel it. Even with the electric assist (praise be upon it) going uphill soon had the muscles just above my knees burning. Fortunately, the new quick-release seatpost clamp arrived quickly (ordered Thursday, arrived Saturday, thanks xxcycle.com). I grabbed my cordless drill and chose a nice new bit slightly smaller than the thickness of the clamp’s bolt, and started drilling. I’m not what you’d call an adept in the DIY department. After a short while, the drill bit appeared on the opposite side of the clamp, next to the bolt. I withdrew and was pondering what to do next when there was an almighty twang! and the saddle dropped to its minimum height. The weakened bolt had simply given up and snapped. Job done. Pulling out the seatpost confirmed the existence of a shim. I soon had the new clamp in position. I’d decided to go for a quick-release model for a couple of reasons. First, it makes it easier to let other people ride the bike. But mostly it was because I knew I’d be fiddling with the seat height quite a lot, looking for the sweet spot. The Sunday morning ride was such an improvement over the previous ones – but I knew the saddle height could be better still. Since then, I’ve adjusted it twice more. I’m fairly certain it’s perfect now, but only the next proper ride will tell. In his book Just Ride, Grant Petersen suggests that you start with the saddle slightly too high, then adjust downwards in tiny increments until you’re happy. If you go the other way, you’ll hit a point where you’re comfortable and will leave it there. But, in fact, if you were only to go a little higher, you’d feel better still. This is good advice and I probably should have taken it. However you go about it, having a quick-release clamp allows you – nay, encourages you – to experiment and make repeated changes. And the difference a small change can make is astounding. After the Sunday morning ride, I increased the seat height by about 1cm, and it made a world of difference. Mostly, you’ll hear that getting the seat height correct is about performance – about using the energy of your muscles to maximum effect. And that’s true. But it’s also about comfort. If the seat is too low – even by 1cm – your muscles never quite relax the whole way around the stroke. (This, by the way, is based on experience – I’ve not researched the science, so don’t expect any.) But if your leg is almost, but not quite, fully extended at the bottom of the stroke, it feels like the muscle releases the tension. It’s so much more relaxing and it seems as though the bike stops resisting you. A bicycle is a very personal machine. Even those of us who have no interest in racing or performance in that competitive sense still want to feel that we are getting the best out of our bikes, because the longer you can spend in the saddle the more fun you’re going to have. And for me, that starts with the seat height.